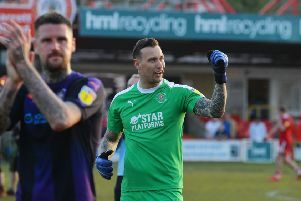 Luton forward James Collins was an unused substitute as Ireland just about saw off Gibraltar 1-0 in their opening Euro 2020 qualifier last night. Burnley's Jeff Hendrick's 49th-minute strike secured victory at the Victoria Stadium, but the visitors struggled to convert dominance into goals against a side ranked 194th in the world. It was the Republic's first competitive win in almost 18 months, while they ended a drought of 446 minutes without a goal in all competitions. Boss Mick McCarthy said afterwards: "I pretty much hated every minute of that match. "I knew what it was going to be like and it didn't surprise me. I just said to the lads 'what a horrible game but a great three points'. "We were never going to complain about the pitch, although it doesn't make it any easier. "It was blowing a gale, but we didn't play well and Darren Randolph was probably man of the match with the save he made to keep it at 0-0. "I was asked earlier about gaining momentum but we can only gain momentum by winning a game and I would have taken a 1-0 win any time. "I don't want that. I want us to score more goals and play better, but it's three points and we move on." Collins will now hope to be handed a chance against Georgia at the Aviva Stadium in Dublin on Tuesday night. McCarthy added: "It will be a totally different game. "They will probably be watching our match back and thinking we are hopeless, but we will play better than that. "They will be looking to gain an advantage and get some momentum going by beating us, but we have got loads to play for now as we have three points on the board."